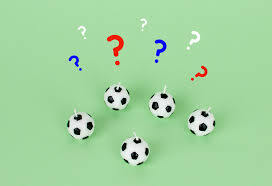 After originally using the internet to look up the next set of fixtures or place a bet on a tip you’ve picked up somewhere along the way, a lot of people are now using it for entertainment, where they will spend a lot of their spare time testing their wits with online football quizzes. Although it might sound like a waste of time to some, these football brain teasers are extremely addictive, and they always use up any time where you were trying to run down the clock over a boring afternoon, or left waiting for a delayed train. As the demand continues to grow, more football fans opt to get involved with online football quizzes rather than merely placing bets, and they certainly know what they want from what they’re attempting to identify. In visiting your favourite football betting website for a quiz, it’s likely that you’ll be met by a lot of options that are built on statistics. Not only does this include things like the number of goals in specific competitions and how many goals specific players were able to score compared to others, but also things like having to identify past nominees for the Ballon d’Or, World Cup runners-up, and the current top scorers from all major leagues. Despite not appearing on most football sites, the starting XI quiz is a way of pointing out which players featured in a memorable or notably poor team from the past. Online football quizzes come in many shapes and sizes, but this is one that arguably comes as the most difficult, as you need to remember every single player – both obvious and vague – or you won’t be able to successfully complete the quiz. Also dipping into the line of statistics-based football brain teasers, the individual players and managers are a factor that most football fans are interested in, so it’s unsurprising to see them covered in so many quizzes. This can include the specific players who’ve scored in a popular fixture over past years, or the managers with the most first division wins throughout Europe, with a lot of top 10s being made to amuse visiting guests. It’s hard to not mention the option of football trivia quizzes, as it’s easily where the concept of online football quizzes first started. Through playing a football trivia quiz, you’ll be pitted with a variety of questions based around Sir Alex Ferguson’s Manchester United managerial career, Steven Gerrard’s playing days at Liverpool, and famous moments that occurred in the last Premier League campaign. Previous PostPrevious Lampard vs Gerrard: who will fare better?